Post: Gaurav Akrani. Date: 9/08/2010. Comments (3). Label: Banking. Banks have developed around 200 years ago. The natures of banks have changed as the time has changed. The term bank is related to financial transactions. It is a financial establishment which uses, money deposited by customers for investment, pays it out when required, makes loans at interest exchanges currency etc. however to understand the concept in detail we need to see some of its definitions. Many economists have tried to give different meanings of the term bank. 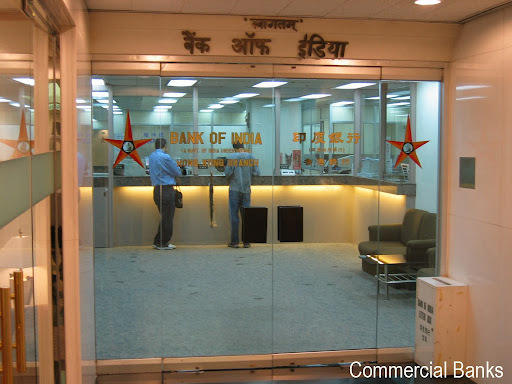 Commercial banks are an organisation which normally performs certain financial transactions. It performs the twin task of accepting deposits from members of public and make advances to needy and worthy people form the society. When banks accept deposits its liabilities increase and it becomes a debtor, but when it makes advances its assets increases and it becomes a creditor. Banking transactions are socially and legally approved. It is responsible in maintaining the deposits of its account holders. According to Prof. Sayers, "A bank is an institution whose debts are widely accepted in settlement of other people's debts to each other." In this definition Sayers has emphasized the transactions from debts which are raised by a financial institution. According to the Indian Banking Company Act 1949, "A banking company means any company which transacts the business of banking . Banking means accepting for the purpose of lending of investment of deposits of money from the public, payable on demand or other wise and withdraw able by cheque, draft or otherwise." Commercial bank being the financial institution performs diverse types of functions. It satisfies the financial needs of the sectors such as agriculture, industry, trade, communication, etc. That means they play very significant role in a process of economic social needs. The functions performed by banks are changing according to change in time and recently they are becoming customer centric and widening their functions. 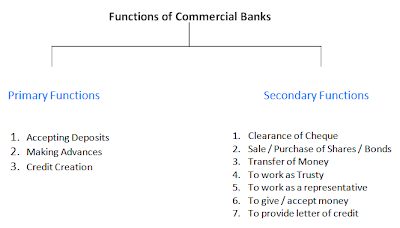 Generally the functions of commercial banks are divided into two categories viz. primary functions and the secondary functions. The following chart simplifies the functions of banks. Accepting Deposits : Commercial bank accepts various types of deposits from public especially from its clients. It includes saving account deposits, recurring account deposits, fixed deposits, etc. These deposits are payable after a certain time period. Making Advances : The commercial banks provide loans and advances of various forms. It includes an over draft facility, cash credit, bill discounting, etc. They also give demand and demand and term loans to all types of clients against proper security. Credit creation : It is most significant function of the commercial banks. While sanctioning a loan to a customer, a bank does not provide cash to the borrower Instead it opens a deposit account from where the borrower can withdraw. In other words while sanctioning a loan a bank automatically creates deposits. This is known as a credit creation from commercial bank. Along with the primary functions each commercial bank has to perform several secondary functions too. It includes many agency functions or general utility functions. 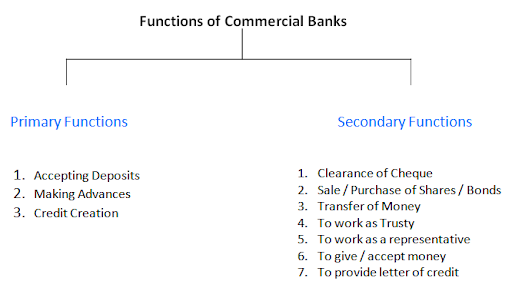 The secondary functions of commercial banks can be divided into agency functions and utility functions. To make payment of rent, insurance premium, etc. it helped me complete my project... giving u my heartiest thanks filled with gratitude... thank you so very much for publishing this and enhancing my knowledge..